A 15″ shutter lets VT-JCM streak through the sky, with its all white anti-collision light system. Turboprop, again. Flying over the geographical south Bangalore, with multiple flight crew on a FAM (Familiarization) course, VT-JCM, an ATR-72-500, has been flying from the last few hours, performing around 15 touch-and-goes, and atleast one ILS approach for runway 27, VOBG. JCM, the 4 year 3 month old leased airplane flying for Jet Airways, India, is part of a dwindling fleet of ATR 72-500s at Jet Airways. The once 20 strong fleet is now down to 18, with VT-JCF and VT-JCH having been sent back to the lessors. Another 4 ATR 72-500s are on their way out, and this will bring the fleet down to 14 ATR 72-500. Why then would you have a FAM flight for first officers when the fleet is being downsized? Because the 6 ATR-72-500s are being replaced by 6 ATR 72-600s from GECAS, possibly in November 2012. The sad part is, that although ATR took great pains to ensure near identical cockpits for absolutely identical airplanes (the only significant difference is the cockpit, operationally speaking), the DGCA does not allow the cross-utilization of crew flying the two variants of the ATR 72. This will drive the turboprop crew to be further broken up into two sets. Cockpits of the ATR 72-500 (left) and ATR 72-600 (right). While the -600 is a full glass cockpit, essentially they’re the same cockpits of the same airplane. As of today, only two examiners in the company have been trained (rated) on the ATR 72-600, one of whom is the Chief Pilot of the turboprop fleet. So maybe, to cater to this new spilt of DGCA recognized “incompatible” crew, training flights are underway on the ATR 72-500 to make up for first officers who will be moved to the -600 fleet. Training flights are interesting. Today’s training flight was being conducted by a “very, very senior” Bangalore based examiner. Typically, the airplane is topped up to 4 tonnes of fuel, and the duration of a FAM flight for each crew member is typically around 45 minutes, with about 10 minutes per visual circuit. Each circuit burns around 200 kgs of fuel. Conditions (18th-Sept-2012, 2300 local): Winds 290/06kts, Runway 27, Visibility 8km, Clouds 1500ft Scattered 8000ft, Temperature 22°, Dew point 19°, Qnh 1014. So how do you go about flying the airplane on a circuit? The visual pattern is performed at 1500ft AGL, which is 4500ft in the case of Bangalore. After takeoff and cleaning up the aircraft (gear up, flaps retract from 15°), the aircraft power is reduced to maintain 170kts on the downwind. Abeam the threshold (touchdown threshold), extend flaps to 15°, take the gear down, and start the timer. When 45 seconds elapses on the timer (+/- 1 second for every kt of headwind), the aircraft is turned to base, descending at about 500ft/min. The Autopilot, if ON, is disconnected for the turn, and the crew checks the vertical situation of the airplane in relation to the airfield, and adjusts the descent rate based on either the glide slope indication or the PAPI. When turning for finals, flaps are extended to 30°, and the approach speed maintained at around 100kts for a light aircraft in nil winds. With the main landing gear touching down, the nose is gently lowered while the flaps are retracted to 15° by the pilot not flying (captain in the case of FAM flights), and the take off config button pressed. Due to the immense aerodynamic braking of the ATR 72’s 12 propeller blades even at flight-idle-blade-pitch, the drag causes the speed to descend to around or below 70 kts. If below 70 kts, the captain takes over via the nose wheel steering, applies take off power, and the first officer has controls at 70kts and above. Rotate, and repeat. 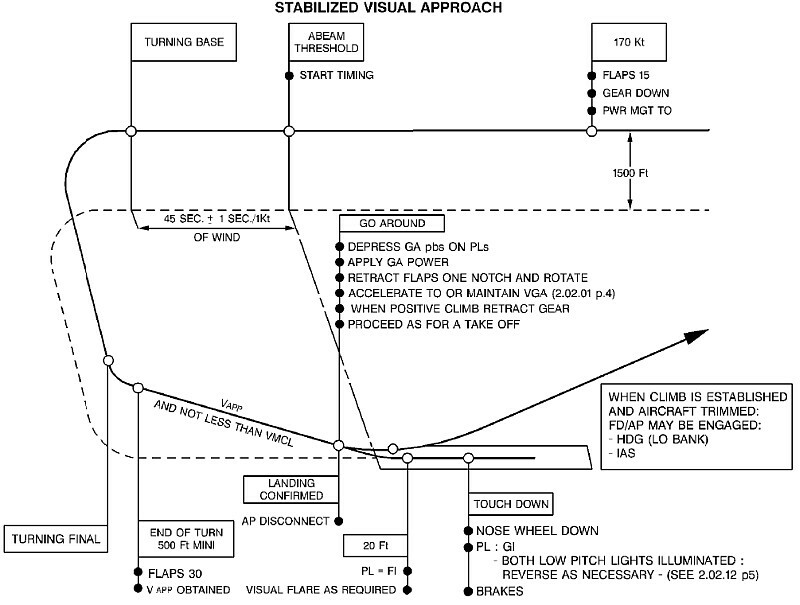 Visual Pattern for the ATR 72, taken from a public site publishing a section of the FCOM. God bless Jet Airways and also all staff .